Here Are Our New Charities! When we ended our last event, we sent out a survey to ask all of you what you would like to see coming up. One question we asked was whether you wanted us to keep with the same charities, or support new ones. Overwhelmingly the response was you wanted to see new charities. To that end, we shared a form earlier this year asking all of you for suggestions so we could find charities you really care about. RGB LAN 2, our second event is just a little more than 3 months away now. Behind the scenes we have been working hard to get everything ready, and today we’re happy to announce the new charities we will be supporting for our next event. Paws for Courage helps domestic abuse survivors to leave their abusers sooner by providing safe, temporary foster homes for pets and covering associated pet-related costs. This fantastic charity was selected due to the perfect intersection between helping people and helping animals. Victims of domestic violence often are unable to escape from their abuser due to threats against their pets, so Paws for Courage helps protect the animals while their owners get to safety. One of the top requested charity types from last year was “animal shelter” and RGB LAN is looking forward to this partnership. The charity has pledged to attend the event. Help Hope Live helps families facing a medical crisis related to a transplant need, major injury, or debilitating illness to fundraise for their medical costs with one-on-one guidance and resources. Like Help Hope Live, RGB LAN staff and attendees believe no one should have to go without lifesaving medical care because they can’t afford to pay for it. Video games are a source of enjoyment and relaxation for billions of people, including many gamers who live with the devastating physical and financial impact of a chronic diagnosis. We want these gamers and other families facing a medical crisis to experience compassion and relief. 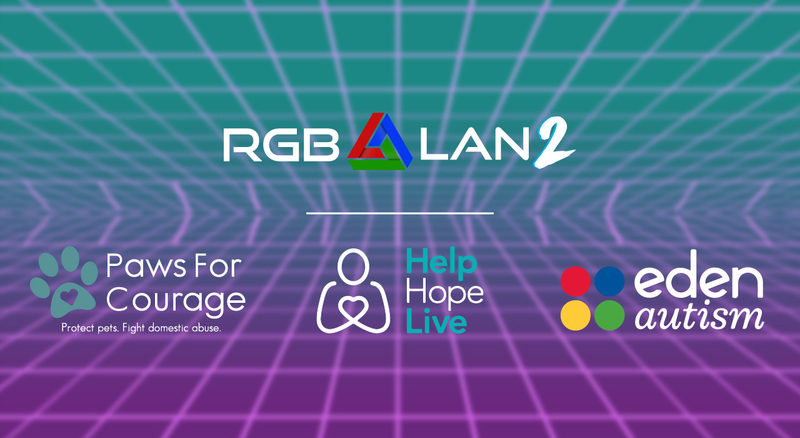 Help Hope Live has pledged to support RGB LAN in person. Eden Autism improves the lives of individuals with autism and their families by providing resources including education for pre-K through age 21, residential programs, employment help and placement, and professional training. Eden Autism was chosen due to personal interest from our attendees in the cause. RGB LAN hosts a diverse range of gamers each year, some who live with autism themselves. Making space for our gamers to champion this cause was simple and has been well-received, with Eden Autism pledging to send staff to the event. Are you interested in helping out these charities? Registration will be opening soon, so make sure you take a look at their websites and choose what charity you want to champion! Share this post around and make sure you take a look at our Facebook, Twitter, Instagram, and join us in Discord! Make sure you keep an eye out for our registration announcement coming soon! RGB LAN 2 Tickets Are Now Live!